A lovely invitation to a harvest lunch at Château d’Esclans yesterday, with the winemaking in full swing. Sacha Lichine, the owner, and in many ways rejuvenator of the whole dry Provence Rosé style in its main export markets, was there and explaining his ambitions for the growth of his Whispering Angel brand. As usual, winemaking supremo Patrick Léon was supervising, and the grapes were coming in fast and furious. 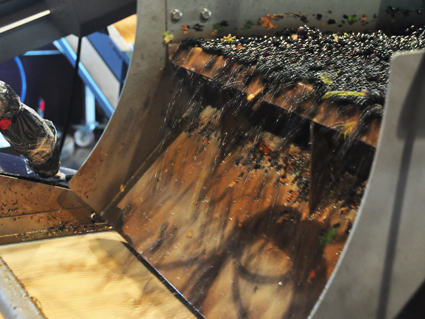 From this vintage, the winery is equipped with an optical sorting machine. This is a massive investment (well into six figures) but can process six tonnes of fruit per hour – far faster than any team of humans at a sorting table. What may be lost in the romance of a hand-made approach is more than made up for in the ability to assess and process the grapes while they are still cool from the vineyard, and before anything starts to deteriorate. This is important at the best of times, but for a delicate style like Rosé it is paramount, and as the winery’s production increases, essential. The optical sorting machine can be programmed with parameters for the perfect grapes and will accept only those that fall within the specifications and reject everything else (rotten fruit, stalks, leaves etc.) it does this by an ingenious air suction system. Thus, only grapes of the ideal size, colour and shape are allowed to progress to the press (after being gently chilled down to 7°C). This is the first time I’ve seen one of these machines in the flesh, and the speed with which it works is phenomenal. The grapes, once chilled, the enter the press, which squeezes them by inflating pneumatically a large bladder, which remains supremely gentle no matter how much pressure is applied. The first free-run juice is called the Goutte de Jus and is very pale, barely pink at all, despite the grapes being fully sun-ripened Grenache Noir. This juice will end up becoming the Château’s top wines: Garrus and Les Clans. Then comes the Coeur de Jus, or heart of the juice. This is the beginning of the pressure and acquires a delicate orange/pink colour in consequence, destined for the property’s Château d’Esclans wine. 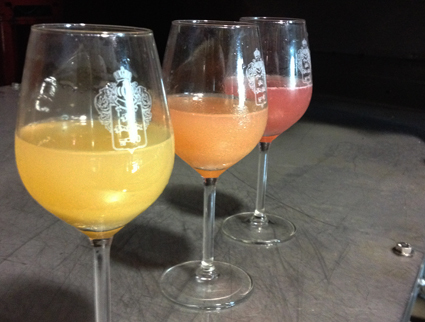 Finally comes the pressed juice which has a distinct pink colour, and this is used for the Whispering Angel brand. The three are incredibly sweet, and there is a noticeable build up in skin flavour as you taste them, as well as a hint of cranberryish tannins in the pressed juice. Patrick, Sacha and their whole team are very happy with both the quality and the quantity of this year’s harvest and it bodes well for a cracking set of wines from the 2014 vintage. We were treated to a wonderful tasting of the current releases as well as a sneak preview of their new tasting room and visitors’ centre, which I will write up soon.